After their roster was ravaged by injuries, the Yankees promoted a trio of promising hitting prospects last week in Tyler Wade, Miguel Andujar and Dustin Fowler. Fowler, the most promising of the three, was supposed play regularly in New York’s outfield. Unfortunately, his big-league career was derailed as soon as it started in horrific fashion. To fill the Holliday/Fowler-sized hole in lineup, the Yankees dipped into their farm system once more this weekend. This time, it was top prospect Clint Frazier who was summoned from Triple-A. Frazier wasted no time making an impact, belting a homer and a double in his big-league debut. 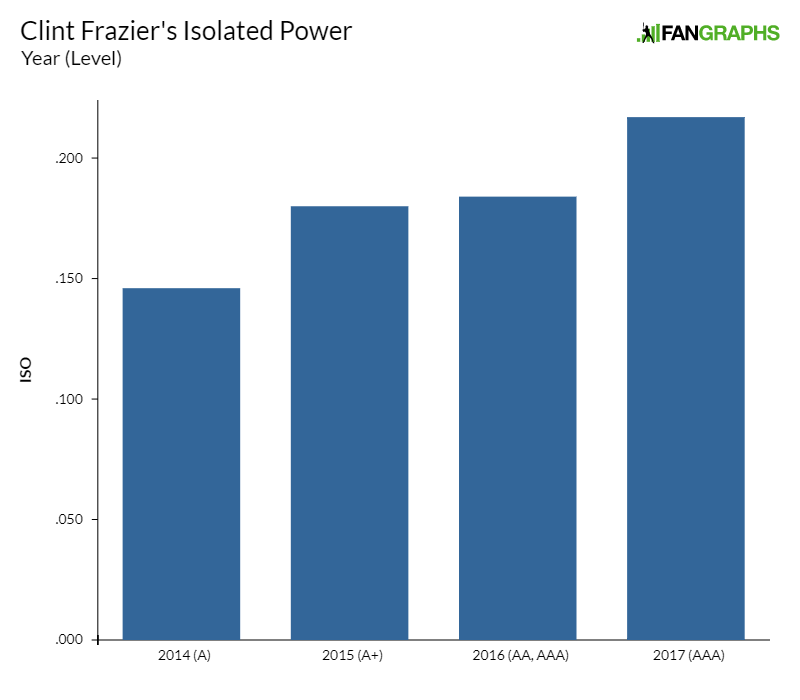 Power is a big part of Frazier’s game, and he’s hit for more of it than ever in 2017. In fact, his power output has been on the rise throughout his minor-league career. He’s done this while simultaneously cutting his strikeout rate. Following his 2014 campaign at Low-A, erstwhile lead prospect analyst Kiley McDaniel asserted that “his 29.7% K rate needs to be closer to 20% to make this work at higher levels.” Frazier’s done just that, and it’s turned him into a consensus top-40 prospect. In addition to hitting for contact and power, Frazier has also posted double-digit walk and stolen-base numbers. He’s also been perpetually young for his levels: he spent one year at each level after starting in Low-A at age 19. As a result, my KATOH system pegs him for 6.9 WAR over his first six seasons by the stats-only method and 8.2 WAR by KATOH+, which incorporates his prospect ranking. Those marks place him 35th and 24th, respectively, among prospects. 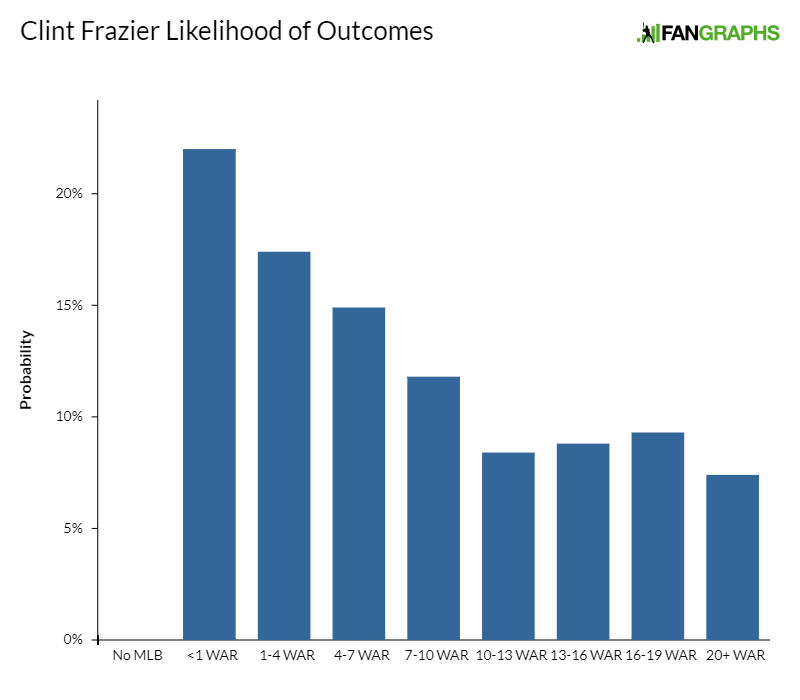 To put some faces to Frazier’s statistical profile, let’s generate some statistical comps. I calculated a Mahalanobis distance between Frazier’s Triple-A performance and every season since 1991. In the table below, you’ll find the 10 most similar seasons, ranked from most to least similar. The WAR totals refer to each player’s first six seasons in the major leagues. A lower “Mah Dist” reading indicates a closer comp. 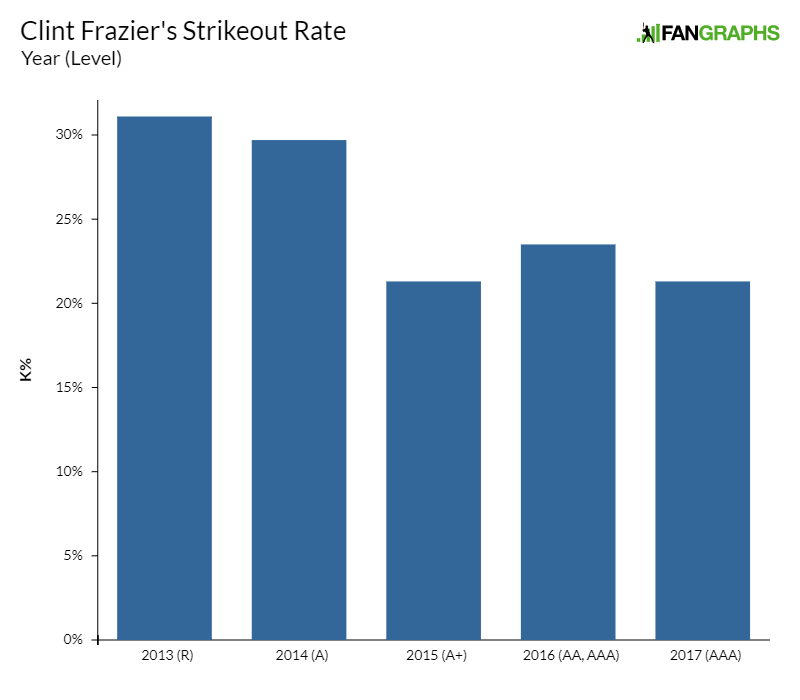 Frazier’s offensive profile is extremely exciting. Twenty-two-year-olds capable of clobbering Triple-A pitching the way Frazier did are few and far between. And in KATOH’s eyes, his hitting far outweighs the fact that he’s limited to an outfield corner, where the bar for hitting is extremely high. We hoped you liked reading Projecting Clint Frazier by Chris Mitchell! Is the bar for hitting at a corner outfield position extremely high? Doesn’t look like it in today’s game.